If you’re looking to either add a more personal touch to your surrounding environment, pass some time or enrich your skillset, this is the way to go! Origami is one of the most amazing and widespread forms of art out there. When you combine craftsmanship with cute animals, nothing can go wrong. This article contains the most creative and unique DIY origami owl ideas and is sure to keep you busy for a while. Either you have already mastered the art of paper folding or you’re just at the beginning, the step-by-step tutorials will surely see you through. 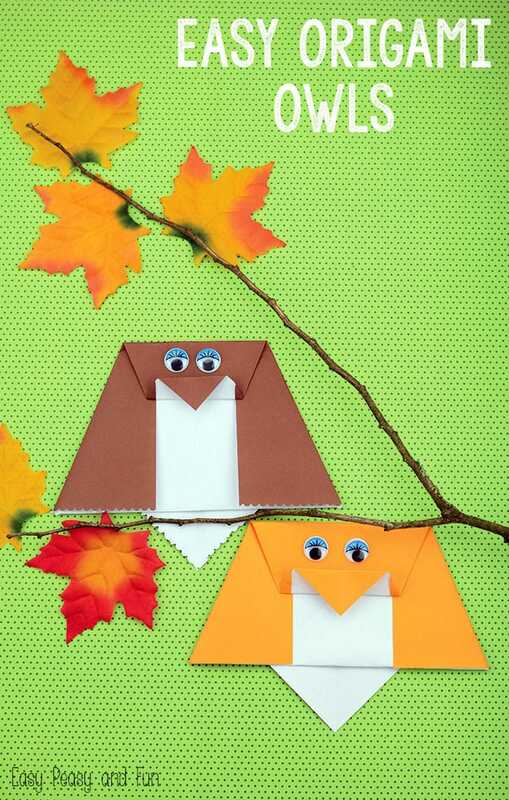 This is one of the simplest models of owl origami. Therefore, it is best suited for beginners or children. If you are a parent and want to spend some quality time with your offspring, you might want to give this a shot. It is both fun as well as educative and a great way to pass some time. It is recommended you use origami folding paper, but any paper will do. If you want to go the extra mile, you can even use colored paper, as shown in the tutorial. This specific model of owl origami is the best for parents that want to enrich their children skillset. Also, it is both fun as well as challenging for the kids. You don’t need to be an expert origami artist. So, if you follow these steps, it is guaranteed you will succeed and spend some great quality time with your loved little ones. This particular origami owl does not require colored paper, but needless to say that the kids will most certainly prefer it that way. This first model of origami owl for intermediates is dedicated to those who have a previous experience with folding paper into different shapes. Even though it requires a certain set of skills you still don’t need to be an expert. However, if you got tired of simple shapes and want to take on a challenge, this video has everything you need in order to make the best origami owl. This particular model is the cutest DIY origami owl idea yet. Also, it is specially designed so you can place it on tree branches or maybe even on door handles in your house or whatnot. Hence, it can be used as a decoration for both the outdoors as well as indoors. As a result, it is fun for all ages and adds a little bit of personality to any environment. Because it is not an easy task to handle, this chart provides all the necessary steps in order to complete it. Due to the fact that owls look their cutest when chilling on branches this model is going to steal your heart as well. Once you finish it you can place this origami owl anywhere you like. However, if you wish to place it somewhere outside the window, for example, it may fly away for good. Some origami models need more folding than others and take longer to complete. As a result, this video contains all the steps you need to ensure you can build your own origami owl. If you’re looking to customize it, you can use colored paper or googly eyes. The name of this model comes from the fact that it resembles an owl preparing to take flight. However, we are not responsible if this actually happens once you’re done with all the folding. It is up to your skill to make this origami owl look as realistic as possible. Or if you simply want to use it as a festive decoration, it’s up to you. Because it is a rather complex origami model, you must carefully refer to the step-by-step instructions. Also, for better results, it is recommended that you use scissors. If you are looking for a challenge this is just it. This particular origami model is as much as creative as it is complex and tricky. As a result, this truly represents a challenge for the origami enthusiasts. Because of the level of difficulty, you will need to pay close attention to the instructions. Also, you can complete this project in complete solitude to avoid any distractions. So, take your time and make the best out of this DIY origami owl idea. This project is for those who have already mastered basic origami techniques and moved on to the next step. Building three-dimensional models means mixing skill with certain specialized methods in order to reach an end result. For this 3D origami owl model you need to use colored origami paper, because it is crucial in terms of perspective. Another aspect worth mentioning is to make sure you follow instructions exactly as presented by more experienced origami artists. If you’re confident in your origami skills, you’re going to fall in love with this complex and intricate DIY origami owl. Besides a sheet of paper, this project calls for half an hour’s time and patience. The result is a unique looking owl with a thoughtful look, large wings and tiny legs. A high intermediate DIY origami owl, this half an hour project requires high-quality paper and extreme precision. For a striking effect, use double sided paper, which creates a beautiful contrast between the front and the back of the bird. These origami owl ideas can prove to be a well-deserved means of relaxation after a busy day, especially if you are the kind of person that enjoys creative challenges. There are countless origami models out there, but these are the icing on the cake. Either we’re talking about children, teens or adults, this form of art is as much as entertaining as highly beneficial for all ages. If you’re eager to roll up your sleeves, try these gorgeous DIY lace doilies that are work well as decorations and double as gifts.